Bento 3 is rightly billed as a database application, but it doesn't quite fit the mould of most traditional database software. Think of it more as a data organiser that lets you bring together, arrange and view all of your data with the minimum of fuss. Data is organised in Libraries, which would correspond to data tables or files in a conventional database. Within each Library, you can set up multiple Collections that assemble records, either manually or automatically, in the same way that an iTunes playlist gathers music tracks together. Since the beginning, Bento has featured close integration with Address Book and iCal. It creates a Library for each automatically, and enables you to use and modify their data directly. 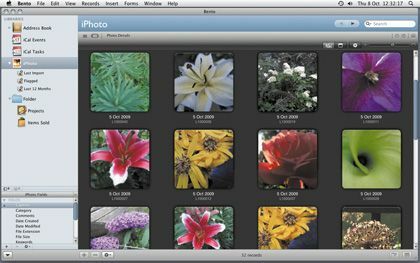 With Bento 3, integration has been extended to iPhoto, so you can now add pictures to your records or even use Bento to catalogue your media with more data options than iPhoto itself can provide. Unlike with iCal and Address Book, though, this is strictly read-only, so you can't use Bento to modify any of iPhoto's fields, such as Rating or Date. One other slightly odd limitation is that Bento can't see iPhoto Events data. If, like many people, you use Events to organise your iPhoto library, this may be an issue. On the Grid To go with its ability to display photos, Bento offers a new Grid layout that provides a visual overview of your records. This is obviously ideal for pictures, but it can also show a thumbnail view of any form layout. Other welcome changes include the addition of folders to help organise your libraries, additional themes for forms, and simple list fields, which enable you to put multiple entries into a single field. Although it's aimed primarily at home users, Bento can work for small businesses too. The stumbling block has always been its lack of security and its inability to share data with other users. Both these objections are swept away in Bento 3, which enables you to share your data with up to five users on a network. Once this is set up, any available libraries will be found automatically by Bonjour, just like shared iTunes libraries and playlists. To provide basic security, you can set a password for the whole database or any library within it, and you can also encrypt individual fields. A separate password controls network access. Priced at £29.95, Bento offers excellent value for money. Even better is the five-user licence for just £59.95. Existing users of Bento 1 or 2 can claim £10 rebate when they upgrade, but only until 28th January 2010. This is clearly a response to the outcry that arose last year when Bento 2 was released with no discount offered for upgraders. However, if the time limit feels too restrictive, it still may not please all existing Bento users. Despite a few niggles, Bento offers a versatile and uncomplicated approach to databases that should appeal to many people. This latest upgrade is a substantial one that brings many new features and improved usability. With a 30-day free trial available, it's well worth giving it a try.